First ever summit, hosted by Lieutenant Governor Duffy, helps strengthen the State’s agricultural economy. Long Island, NY - December 7, 2014 - Governor Andrew M. Cuomo today highlighted results from the first-ever Farm to Table Upstate-Downstate Agriculture Summit, which was introduced in the Governor’s 2014 State of the State address. 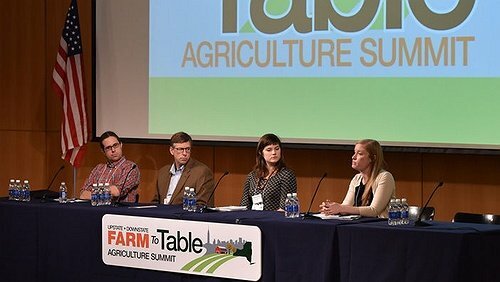 The purpose of the Summit was to explore ways of increasing access to fresh food for underserved populations and growing New York City markets’ access to upstate agricultural producers as a means of boosting in-state production and consumption. Lieutenant Governor Robert J. Duffy presided over the first-of-its-kind summit, which took place today in New York City. Regional Food Wholesale Farmers’ Market – The Governor is committed to developing a Regional Food Wholesale Farmers’ Market, and state government will work with local and private partners to identify the resources and appropriate site. This market will enable the upstate agricultural industry to increase access to metropolitan markets for producers, while providing an array of healthy, affordable food for communities. It will also serve as an aggregation hub and processing facility to assist upstate producers and processors in targeting institutional and private sector procurement. Development of a Regional Food Hub Task Force and Action Plan - This new Task Force will consist of a balanced membership of stakeholders from upstate and downstate New York, including members of New York City government named by Mayor Bill de Blasio, along with members of New York State government named by Governor Andrew Cuomo. Working together, they will develop a plan to expand the distribution of regional foods to the New York City marketplace. A report will be presented to Governor Cuomo on how to expand regional food hubs across New York State within the next 90 days. Food Box Expansion Program – This Program fulfills Governor Cuomo’s commitment to increase local food access to underserved communities by dramatically expanding the already-successful food box model to upstate and downstate neighborhoods. This program will enable underserved, low income communities to purchase New York State fresh and locally sourced fruits and vegetables. Consumers can use their SNAP benefits to pay for food boxes on a weekly or bi-weekly basis. This program will bridge the gap between farmers and consumers; farmers will benefit by selling more produce; and consumers will benefit by having access to fresh, healthy food. State funding will cover administrative costs associated with qualified and competitively chosen organizations plus procurement, transportation, distribution and nutrition education. New York State is committing $500,000 for this initiative. Buy NY - Governor Cuomo announced the formation of a new initiative called “Buy NY,” a joint effort by the State Department of Agriculture & Markets, Department of Corrections and Community Supervision, Office of Mental Health, Department of Health, Office of General Services and Cornell Cooperative Extension, the purpose of which is to leverage existing centralized contracts regarding the purchase of State food products, including produce and dairy products. One of the initiative’s goals is to help state and local governments increase the purchase of local agriculture products in government-run institutions such as hospitals, colleges, prisons and other facilities. A new “Buy NY” website will be launched by the Office of General Services in January to provide a portal for state and local governments to learn more about purchasing New York State-produced products. It will also help educate New York agricultural producers and distributors about the state contracting system, which is available to all 62 counties and hundreds of municipalities across the state. SUNY Farmers’ Market Certification Course – The State, in cooperation with the Farmers Market Federation of New York and six SUNY campuses, will develop a curriculum to improve the quality and performance of farmers markets across the state. These courses will help market managers improve their promotion of farmers markets and any market-based incentive programs offered at the farmers markets. Taste NY Culinary Tour – This initiative will provide tours for downstate restaurateurs at upstate farms to cultivate stronger business-to-business relationships between the two entities. Governor Cuomo has made opening new markets and increasing opportunities for New York State agriculture producers a priority, committing to maximize business between upstate producers and downstate consumers through the State’s multi-billion dollar agriculture industry. This is being achieved by creating new marketplaces for agriculture producers, increasing the “buy local” purchasing power of State institutions and facilitating connections to spur economic growth while keeping New York food marketplace dollars in the State. In 2011, the Governor created the FreshConnect Farmers’ Markets to increase access to healthy, locally-grown foods and address the issue of food deserts in the State’s urban areas. The Administration has invested $3.6 million in food hubs in Canastota, Kingston, Groton, Canton and Riverhead, providing a location for farmers to deliver their goods and get them processed for distribution to restaurants, grocery stores and consumers. The Governor also created one of the most effective marketing initiatives in New York State history, Taste NY, the goal of which is to highlight New York’s world class agricultural products to the masses through stores, events and special initiatives. He recently announced the next phase of Taste NY, which will include a revamped website with online purchasing options, Taste NY stores and vending machines at all SUNY and CUNY campuses, expanded Taste NY options at all 27 New York State Thruway Travel Plazas, additional Taste NY products in vending machines and a mobile phone application. Subject: LongIsland.com - Your Name sent you Article details of "Governor Cuomo Announces Highlights from the 2014 Farm to Table Upstate-Downstate Agriculture Summit"